Which is the best way to relieve stress? What do you think? Is it a problem that can be resolved in seconds by using a technology? Or a problem that becomes bigger if you ignore it? The answer is Yes, if you ignore it and don’t take proper action you will be in trouble! Because stress is the only cause that leads to other major health issues, nowadays. So how can you reduce your stress in the easiest way. It can be only Meditation or Yoga. Some people take medicines to cure stress due to lack of time for doing physical activities. But, this can be more dangerous for them. Medicines can cure people only for a short period of time and thereafter, affect them a lot. So if you are a busy personality or a lazy person who can’t spend time on doing meditation, but can spend some time on a mobile phone. You can do one thing by installing an app called “SOS Method: Meditation”, which is a brilliant app developed especially for the modern minds. It’s basically an app that will help you feel energetic, happier and healthier. This app is accessible anywhere at anytime and works in 5 minutes. With its special formula meditations, programs and life tools by your side, all you need is 5 minutes daily to maintain a balance, overcome stress and anxiety, improve focus, sleep better and much more. You can achieve a lot with the SOS method. SOS Method is so powerful and impactful. It teaches you mindfulness as an essential part of a healthy living by taking a holistic approach to the wellness of the body, mind, and soul through meditation. The app uses a proprietary formula where each meditation is individually engineered and produced, fusing specific elements in music with tone, words, and white space. It combines time-tested wisdom, Eastern healing techniques with landmark western scientific discoveries and leadership training. After meditation, you will have less stress, depression and anxiety and you will focus better on the things and sleep better. People from all over the world are using SOS Method of doing meditation during stressful situations and feel hopeful/inspired, and gaining super vitality. It gives you rapid, direct access to an inspired mind, emotional balance, and physical well being. SOS Method has been considered as the art and science of wellbeing, made readily accessible for a busy world through the magic technology. SOS Method has been developed by SOS Method, Inc. and has been compatible with the iPhone, iPad and iPod touch, having iOS 11.0 or any later version of the Operating System. The app is available for free on the iTunes Store. today. Because it’s now or never! 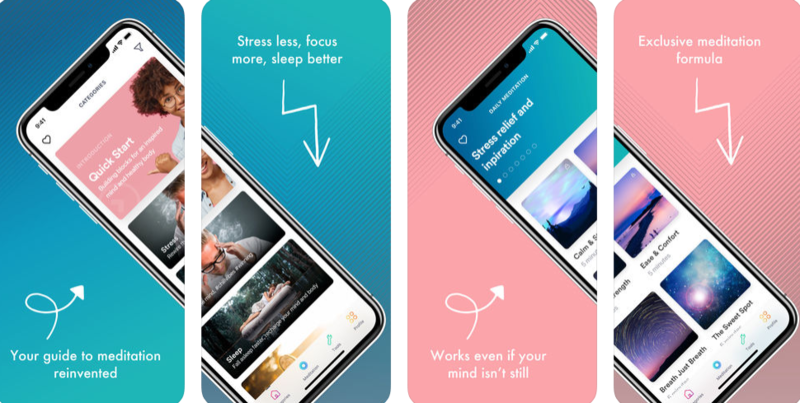 Pros: different approach to relieving stress; easy to use; motivating app; requires only 5 minutes; can change your mind and soul; feel happier and healthier.